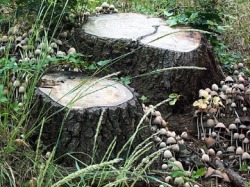 Stump Grinding is the removal of unwanted stumps that are left from the tree being cut down. A chainsaw cuts down the tree and then thats when a Stump Grinder comes into play. A stump grinder generally removes a stump 6-8" below ground level which kills the stump as well as the roots. I chase surface roots until the are no longer visible.